The Internet has given us many new words: one is newbie. It means newcomer or initiate. Many professions have formalized status for newbies: doctors begin as interns, attorneys as associates, pilots as co-pilots, and more. Typically, newbie rank is a way to continue your education in an environment uniquely suited to teaching important lessons. You do become a part of a team, but your main contribution is your own education. Stephen G. Breyer, Associate Justice of the United States Supreme Court. 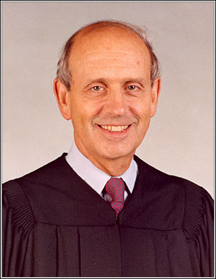 In the 1964-1965 term, Justice Breyer served as Law Clerk to then Associate Justice Arthur M. Goldberg. Justice Goldberg is perhaps best known for his concurring opinion in the case of Griswold v. Connecticut (1965), where he argued that the Ninth Amendment supported the existence of an unenumerated right of privacy. It is this case that ultimately led to a chain of privacy-based decisions, including Roe v. Wade, which enunciated the right of women to gain access to abortion services. As Justice Goldberg's law clerk, Justice Breyer assisted in the drafting of Justice Goldberg's opinion in Griswold. It is perhaps not surprising that Justice Goldberg himself also has a connection to the role of newbie. As a young man, he was a member of a spy ring operated during World War II by the Office of Strategic Services (OSS), the predecessor of the Central Intelligence Agency. In that capacity, one of his colleagues was Julia Child, who later achieved fame as The French Chef in U.S. public television. (See, for example, CNN's article, "Chef Julia Child and others part of WWII spy network".) Photo courtesy United States Supreme Court. For many, it's a difficult role. Achieving a goal so long desired, only to discover that the path leads through positions of such low status, can be frustrating indeed. Being the least of the best — even when it is also the best of the least — can be a painful reality. Here is Part I of a set of guidelines for newbies, emphasizing the inner experience of the role. Jumping in with both feet probably won't work. Assume that you'll have to earn the respect of all, and that you'll fail with some. Easing in gently, listening and observing, helps you avoid the blunders that can harden impressions of you prematurely. However frustrated you feel about being a newbie, accept the reality. Don't try to prove that you're better than people seem to think. Everyone knows you have talent — if you didn't, you wouldn't have been accepted for the position. The value you offer is a channel for investment. Since the team is investing in you for the future, rather than the present, your main job is learning. Demonstrate that you can learn, and learn fast, and you'll impress the people who are responsible for making your learning possible. See your mistakes and ignorance for what they are: emblems of your newness and humanity, rather than proof of defect. Accept their existence, and do what it takes to plug the holes in your knowledge and prevent repetitions of mistakes. All the competent stars around you went through much the same thing you're going through now. the respect of all.learning will be painful, because much of what we learn comes from errors. If you have trouble dealing with your own mistakes, fix it. Most important, remember that this stint at being a newbie won't be your last. There will be a first time for you in many possible roles: spouse, parent, Nobel Laureate, nursing home resident, and on and on. Learning how to be a successful newbie might just be the most valuable lesson of all. Would you like to see your comments posted here? rbrenJHnbWPPmHecyZUsEner@ChacvvoGiSfdmDKbcEhtoCanyon.comSend me your comments by email, or by Web form. I offer email and telephone coaching at both corporate and individual rates. Contact Rick for details at rbreneoPRTOlmiRgfDdxSner@ChacUSicLHeEYaqFJDhEoCanyon.com or (650) 787-6475, or toll-free in the continental US at (866) 378-5470.